Epigenetics Could Turn on an ‘Obesity Switch’ | What is Epigenetics? We know that a predisposition to become overweight is found in our genes. Now, we’re starting to learn that epigenetics also has a hand in determining whether a person will become fat or lean. New research is uncovering the possibility of an epigenetic switch that is, interestingly, either “on” or “off”. A group of researchers at the Max Planck Institute of Immunobiology and Epigenetics in Freiburg published their study in Cell. More than one-third of individuals are considered to be overweight or obese, according to the National Institute of Diabetes and Digestive and Kidney Diseases. It’s an issue that has been plaguing our society now more than ever, especially with easy access to fat-laden fast food and chain restaurants that serve up enough calories for an entire day in a single meal. Obesity can also lead to serious diseases such as diabetes and cardiovascular complications. It is even a risk factor for cancer. It has been thought that obesity is determined largely by DNA, but our environment is also important. The group’s collaborators in Brisbane, headed by Emma Whitelaw, originally discovered that a mice strain that had only one copy of the TRIM28 gene, as opposed to two, displayed large variations between body weight despite their genotype being identical. “We were intrigued by these findings. They suggested the possibility of a purely epigenetic disease,” said Andrew Pospisilik, whose group has experience in studying epigenetic effects in metabolic diseases. These particular mice, they found, were either normal or obese. Kevin Dalgaard, the first author of the study, said they were surprised that mice that are genetically identical could have two different but very stable phenotypes. They compared gene expression across the entire genome between the fat and lean mice. They found that certain imprinted genes – which are exclusively expressed from either the gene copy inherited from the mother or the father – were expressed less in obese mice. Working with other collaborators in Cambridge, the authors demonstrated that losing a copy of these imprinted genes led to a bi-modal body-weight distribution in mice. This suggests that the network of imprinted genes acted as a switch between the two body types. But what about humans? The researchers set out to see if the same pattern existed between obese and normal children. They teamed up with specialists in childhood obesity and analyzed adipose, or fat tissue, from children with these body types. In half of the cohort, results aligned with what they found in the mice. The expression levels of TRIM28 and the imprinted genes were altered. Specifically, the team examined data of multiple cohorts, and found that humans “segregate into two apparent sub-populations stratified by Trim28 expression, high-dimensional transcriptome arrangement, and body-mass index.” In addition, the researchers uncovered similar trends in other published data of identical twins. In these studies, one twin was lean and the other was obese. “Our data not only help to understand the interaction of genetic and epigenetic factors in obesity and other diseases, they have implications for how we think about evolution,” said Pospisilik. Their results also support polyphenism in mammals. That is, an identical genotype could result in specific and different phenotypes. For example, honey bees demonstrate polyphenism because even though they may have the same DNA, they could become a queen or worker bee. 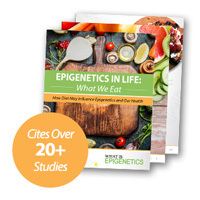 Although difficult to prove, this research shows that epigenetic machinery works to control polyphenisms, producing distinct variations in phenotypes despite having identical DNA. “Taking the whole population into account polyphenism adds diversity and thus could provide a buffer function. If one phenotype is not suited for critical environmental conditions, polyphenism offers a plan B, which could potentially contribute to the survival of the species,” Pospisilik said. Source: Dalgaard, K., Pospisilik, A., et al. (2016). Trim28 Haploinsufficiency Triggers Bi-stable Epigenetic Obesity. Cell, 164(3): 353–364. Reference: Max-Planck Institute. Epigenetic switch for obesity. 28 Jan 2016. Web.